Gigantes plaki, or baked giant beans, are about as Greek and about as good as a dish can be. There are countless variations of this classic dish and the recipe below is our family’s favorite. This recipe calls for parsley, celery, oregano and mint to flavor the delicate tomato sauce and beans. This combination is a bit lighter, brighter and slightly sweeter in taste than other versions with dill, carrot and/or cinnamon. Truth be told though, I don’t think I’ve ever met a plate of gigantes I didn’t like! Busy schedule? No worries – gigantes plaki can easily be made in parts or stages, I do it all the time. Prep your gigantes (or large lima) beans up to 2 days ahead, make your sauce the day before and then assemble and bake when you’re ready to enjoy – its just that easy. I often start soaking my beans in the morning and cook them later that same day – late afternoon or evening. Try to give your beans at least 8-10 hours of soaking time but you can go with as little as 6 or 7. 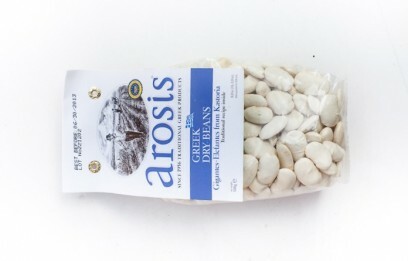 I like to use Arosis brand gigantes but feel free to substitute any large or ford hook lima beans. Soaking your beans makes a big difference so don’t skip this step! The beans are much less gassy and take much less time to cook. You can set aside the cooked beans, covered in the refrigerator, for a few days until you’re ready to bake them. And the sauce takes really no time at all so I just make that right before adding to the pre-cooked beans and baking. The bean baking time here is about 2 hours in a 350 degree oven. I know many people who hike up the temp to 400 and cook for a hour and thats ok but to me, this is a slow cooking dish and the flavors will thank you for the extra time to come together. 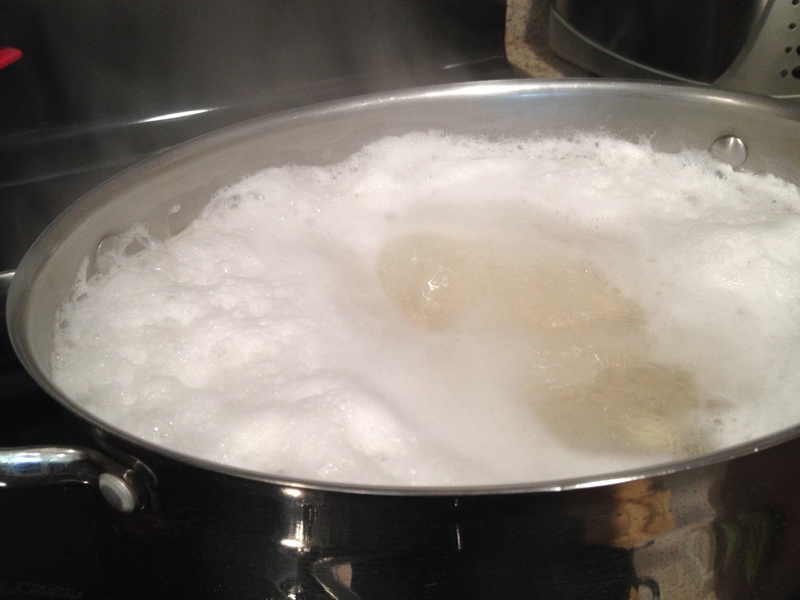 Remember that gigantes (or large lima) beans foam up quite a bit when you cook them. Don’t freak out if its your first time and don’t go too far from the stove as you’ll need to skim off the foam every 10-15 minutes or so. Its a messy affair should it boil over onto your stovetop…..
To boil beans, cover with about 2-3 inches of water, do NOT add salt, and cook over medium-high heat for about 50 minutes from the time you put the pot on the heat. They should be done but not too done and will finish their cooking later in the oven. MAKE SURE TO SAVE 2 cups of the cooking water before you drain the beans. You’ll need it later for the sauce. It adds some of the starch from the beans into the sauce and gives you a thicker/creamier sauce. 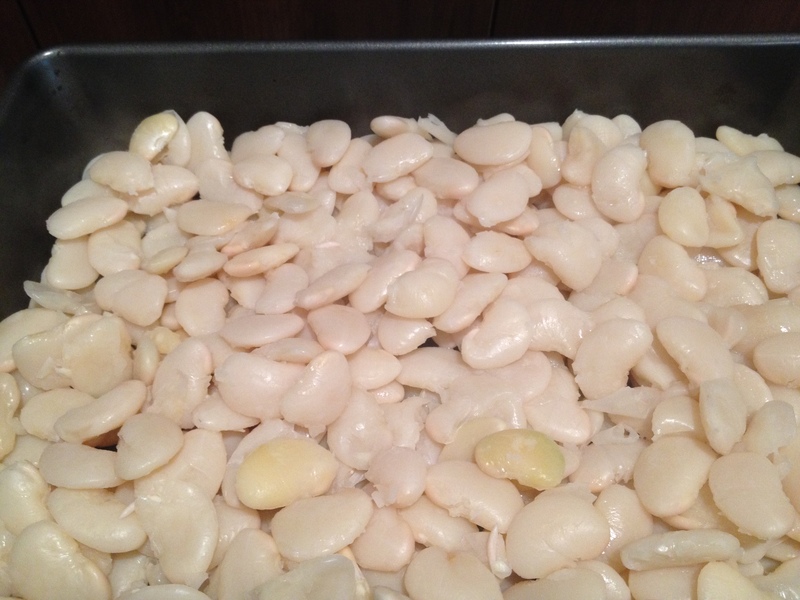 When ready to bake your gigantes, gently spread the boiled beans in an even layer in your pan. I find a 9x13x2 inch baking pan is perfect for 1 pound of beans (dried). 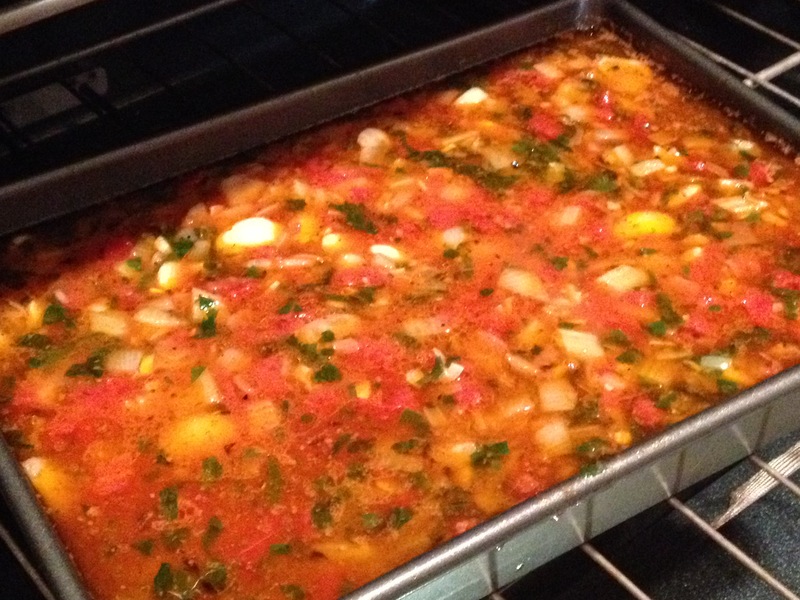 For doubling or tripling the recipe, I use a large, deep ceramic casserole dish. The sides are about 4 inches high to accommodate the additional sauce. When making the sauce, a cup of olive oil may seem overly generous but you want your finished baked beans to be creamy good and this is the only fat in this dish so pour on! Sauté the chopped onions and celery, until they’re soft, add the garlic for a minute or two until tender and then add herbs and spices. Give the pan a good stir to mix everything together evenly. Then cook for only another minute just to release the flavors oils and add the crushed tomato. Cook for 5 minutes to bring the sauce together and then add your reserved cooking water. 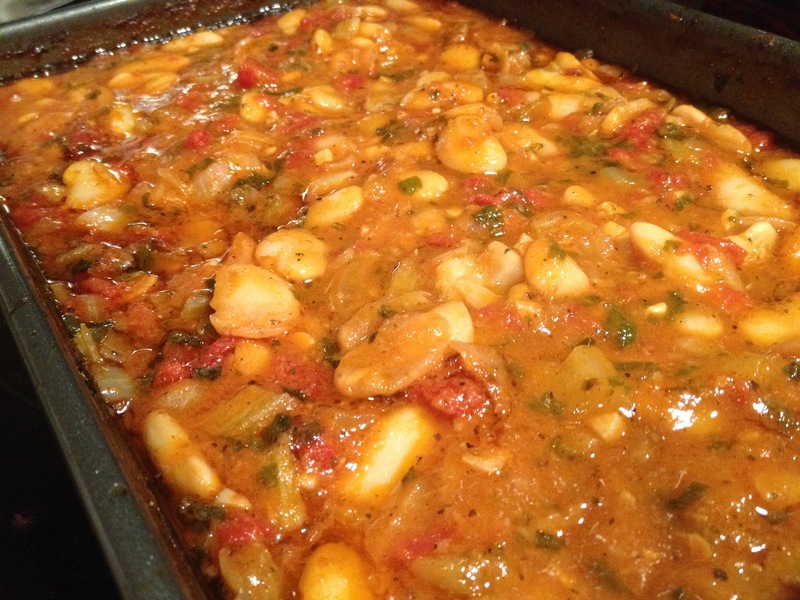 Bring sauce up to a boil and set aside until ready to bake your beans. When ready to bake, pour sauce over beans layered in pan and carefully stir to incorporate everything. Add 1 cup of water (room temp) to the pan and cook at 350 degrees for 2 hours. I give the pan a gentle stir every half hour or so but it isn’t absolutely necessary if you have to leave it on its own. Most of the water will have been absorbed and its a good idea to stir once and then allow the beans to stand undisturbed for about 15- 30 minutes before serving. Soak dried beans overnight or at least 7 hours. 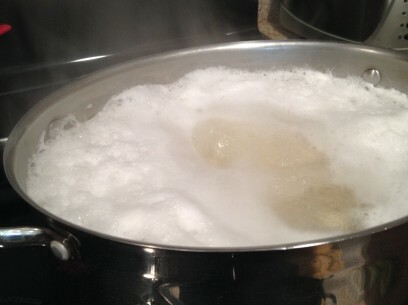 Boil for 50 minutes and RESERVE 2 cups of cooking liquid before draining beans. Saute chopped onions and celery in olive oil over medium low heat until tender. Add garlic and cook for a few minutes until soft. Add herbs and spices, mix to combine completely and cook for just a minute to combine flavor oils. Add chopped tomatoes, stir to combine and cook for 5 minutes. Add reserved bean cooking liquid and bring sauce up to a boil. Remove from heat and set aside until ready to bake the beans. Layer cooked gigantes beans evenly in 9×13 baking pan and pour sauce over top. Add 1 cup room temperature water and bake, uncovered, for 2 hours in 350 degree oven. Stir approximately every half hour or so. Allow baked beans to rest for about 15-30 minutes before serving. Serve with crusty bread and a glass of buttery white wine for a most wonderful, traditional meal. ROOM TEMP works well. Thanks KIKI. Hello Kiki, this is a fantastic recipe and I thank you for it! I do wonder one thing. There’s only one food that I miss all this time and that is feta. I tried out marinating tofu in olive oil and herbs, because people said it’s tasty. I don’t think so at all. So the next time I tried it, I bought what other vegans told me was the tastiest tofu and put it in a salty brine, I thought it was clever! But again, it just tasted like tofu. I tried various store bought cheese alternatives and seasoned them, all to no abail. I’ve tasted some really good mozzarella and parmesan alternatives, but nothing reminiscent of feta so far… Do you have an idea? Hi Thomas, so glad you like it – one of our favorites too! I always use the vegetarian times almond feta recipe and it never fails. People rave about it! I recently made the feta from The Non-Dairy Evolution cookbook, and I LOVE it!!! It blends the tofu with coconut oil and marinade. Then you firm it up in the fridge and crumble it. Only problem is it melts completely in heat, so you can’t put it in things like spanakopita. Can I use canned butter beans as a substitute for the gigantes? Someone suggested this as a shortcut. This recipe looks amazing. It seems like a lot of olive oil for the amount of beans. Can it be cut down or is it necessary for the taste and outcome of the recipe? This will be cooked this Easter! Amazing! Do you have any other ideas what to serve for Easter meals? Tsoureki? Bobota? By crushed tomatoes, do you mean chopped fresh ones or canned? Do you peel your fresh tomatoes before you crush them, or do you use skin and all? Absolutely one of my favorite meatless meals. So delicious. I am always amazed how similar Greek and Neapolitan cooking are. Can you make this in a crockpot? Thank you! This is a very tasty recipe. I am now in love with this dish. Have made it several times and I have at least 6 bags of beans in my pantry. This dish is very simple to make. The only change I made was that I omitted the mint. I have never been a fan of mint and I NEVER use it. This dish is perfect without it. I discovered your blog right before we took a trip to Greece. I was doing some research about what kinds of vegan foods would be available and stumbled across this site. I’m so thankful! We were able to find and eat most of these dishes in Greece and had the absolute best time. 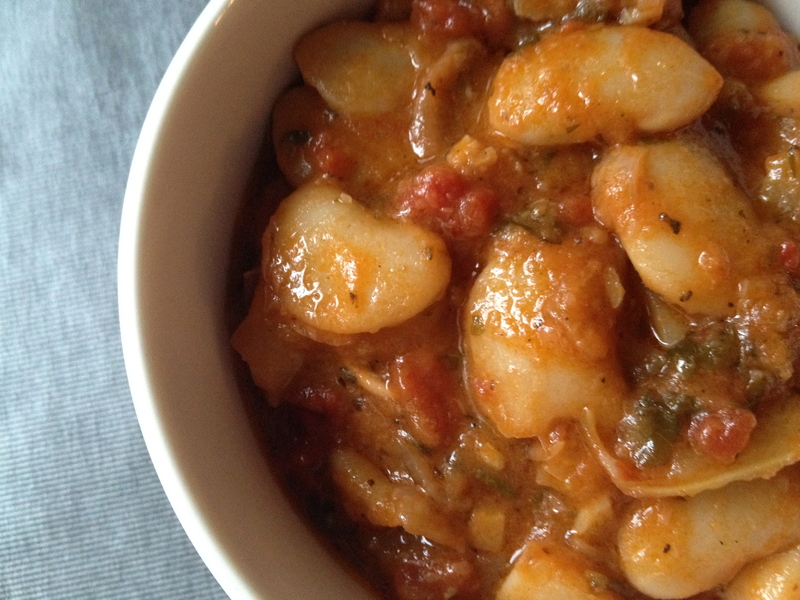 Now that we’ve been back for a while, I’ve been making my way through some of your recipes and they’re just like I remember, and in the case of these Gigantes Plaki, WAY BETTER than even those most amazing beans that I had in Greece. Your family recipe is amazing! Thanks so much for doing what you do! I’m completely full on fava, gigantes and melitzanosalata RIGHT NOW because of the Greek Vegan. Can I freeze this, I have cooked far too much. It’s delicious! Yves! check some Italian delis or markets, I found this brand in Brooklyn so I believe some other Italian stores might have them as well. Wow, I saw this recipe on the Instant Pot FB page, which led me here. I’ve never been to this site before, but based on everyone’s comments, I made these beans last night. I didn’t have limas, but I used Rancho Gordo giant corona beans. Otherwise I followed the instructions exactly, and this is the BEST POT OF BEANS I’ve had in a long time. I make a lot of beans and am pretty picky about recipes, and I was intrigued by this one. I know that 1/3 c. chopped garlic and 3/4 c.chopped parsley may sound like a lot, but do not be tempted to cut back on any of the ingredients. I think it works incredibly well here, just delicious! Finished recipe last night – oh my. Words fail me. Sauce is light, fresh, beans were soft with just a light crisp on the skins of the ones on top, just wonderful. Thank you! I just made this. Unfortunately, when I cooked the beans (lima beans) they turned to mush. Perhaps they were old? I did take off the skin after soaking. Am I not to do that? Thanks! Wow. Honestly the best thing I’ve cooked in awhile. A new staple in our house. Thanks so much! I enjoyed eating gigantes plakis when I traveled to Kefalonia last September. I ate them and sardines every opportunity I had. I recently bought some Royal Corona beans from Rancho Gordo, and I intend to make giant beans in the oven with them. Your recipe will be a handy resource. To make the recipe easier and quicker, I used canned cannellini beans, and I did not add the last cup of water before baking because I thought canned beans would not need the additional liquid. Holy cow, these were the most delicious baked beans I have ever tasted. My taste buds thank you for this website! just made this – delicious! it didn’t have quite as much sauce left after baking i thought so next time ill add more oil/bean water/tomatoes i think! These are AWESOME! I used Cannellini beans (Eden brand) since that’s what I had on hand, plus dried mint and dried Greek seasoning because I didn’t have fresh mint or dried oregano. It’s super creamy and flavorful and totally takes me back to Naxos where I first had a dish like this! Thank you for the simple and yummy recipes. Waiting to try out the stuffed peppers and tomatoes next! Thank you for the simple and delicious recipes. I’ve made this before and it’s awesome. I’m not a vegetarian but this is the type fish that could win me over. I’m making it very soon Shan, I lost the recipe I’m so glad I found it again. Thank you. Just checking – do I cover the beans when baking or no? I assume no… But I think I should somehow? This looks fantastic! I’m going to try this weekend. Do you ever do part of it in advance? I was goong to soak and boil the beans, and then not bake them until several hours later. Does that sound like it will work, or do the beans need to be piping hot from the boiling before you bake them? This is a fabulous recipe. I see lots of comments about wanting to cut down on the olive oil (and in fact, I do). However, the most delicious Greek cooking I have enjoyed has always involved tomatoes sauce and lots of good quality olive oil. Thanks for this! A definite keeper! Just tried this yesterday, but left out the mint. It’s excellent! However, I think it’s best to add the parsley toward the very end of baking, or just before serving. The parsley basically disappeared in the beans, without leaving any noticeable taste. I think I may add some chopped carrots next time as well. This is THE BEST!!!! i made half the recipe just to be sure i liked it and i wish i had made 2x. I wouldn’t dream of cutting down the olive oil. I discovered canned “butter beans” at the grocery store. If someone doesn’t have the time to boil beans, these, drained and rinsed work just as well for me. Instead of using the bean liquid, as in your recipe, I would add water. Seriously, they are a real time saver, and might make the difference for someone who would love to try your recipe, but who doesn’t have the time. I don’t need to add as much salt when using canned butter beans, but that’s a matter of personal taste. Your recipe is fabulous. My moms recipe calls for sliced carrots, which I love. Have you ever added them to your recipe? I’d love to try your version, but add in the carrots. I absolutely loved this. The long slow bake and herb and spice combination made it so delicious. Due to some health problems I am on a special diet and didn’t use any oil, just a tablespoon of almond butter but it still tasted wonderful. Thanks for sharing! This brought me back to the little mountain town I was snowed in at while visiting Greece in the early spring. There was only one guest house and one tiny taverna down stairs. When we tried to translate “vegetarian” to the chain-smoking cook he laughed at us. To our amazement, he made the best bean dish I have ever tasted. This recipe speaks to that same home cooked goodness. The only changes I made were using Red Scarlett beans (because that’s what I had) and (for my father’s dietary restrictions) 1/3 of the olive oil. Everyone had seconds, then thirds. Thank you! This was SO DELICIOUS. P.S. Don’t be scared by the mint in this. It’s absolutely wonderful in this dish. Thanks very much for this – it deserves to be at the top of Google for “gigantes plaki”. This dish is a hit with everyone I give it to. I find some crumbled feta makes an excellent topping as well. Hi Kiki. I made this recipe with gigantes from my local Greek Market. The dish was delicious but my beans were a bit hard. I soaked them for ~ 10 hours, boiled for 50 min and then baked for 2 hours. The flavors were so yummy but wondered why my beans were not soft. Help ! Diane, not to knock you local market but I believe the beans were old. that’s really the only way to explain what happened to you. unfortunately, it happens to everyone at one time or another. And, the thing is, there’s really no good way to tell when beans are old at the time you buy them. Dried beans have an ‘indefinite’ shelf life BUT the longer they hang around, more than a year usually, the moisture inside of the beans starts to diminish. This is so helpful to know. I really liked the flavor of the dish so I will give it a try again. I really love all your recipes. I have just recently discovered the site and have been experimenting. Thank you ! Ijust found you blog and wow!!! I saw your recipe for Constantinople cake on Pinterest and was intrigued by your blog name. I had some of the tastiest food while in Greece and was really interested to find some authentic, vegan, Greek food. I have gone through about 95% of your recipes (going back in time from your most recent) to this so far and I don’t plan on stopping! I have saved every recipe I have seen so far! They all look amazing!!!! I can’t wait to try each one! I just have to say that you speak my language!!! I must be part Greek because I am all olive oil, all the time! I love the amount of olive oil you have in your recipes! Lol. I just want to say thank you for sharing your amazing (looking and sounding) recipes and I cannot wait to go crazy trying all of them! Once again, thanks! Stumbled upon this recipe trying to find another recipe for gigandes and as it required one less ingredient than my usual one, tried it out. It took me longer to cook down than the specified time; the oil wasn’t cooking into the dish at my desired level. I only made a half recipe, planning to use it for my work lunches. We ate most of it the first night! I might try it with a little less oil next time, solely on the basis of the baking time. How many servings is in this recipe? I love this recipe so much! I cook the beans (soaked overnight) in my instant pot – 45 minutes at high pressure, and they come out perfectly. Then I follow the rest of the recipe and bake them as recommended. SOOOO good! For you those of you who leave out the mint, I would recommend that you try it. I don’t taste the mint at all, but I think it adds to the complexity of flavors. As I was eating some of the leftover beans this morning (yes, for breakfast! ), I thought, this would be great with pizza flavors! I intend to try it next time adding in mushrooms and olives, and cutting out the mint. and the mushrooms sound like a wonderful addition! Kiki: Would using fennel in addition to or replacing celery be authentic? Also, your recipe doesn’t have dill. Isn’t that normally used with fresh parsley in the dish? Actually, I love this as is, but I add 3 or 4 sliced carrots (depending on size). I’ve tried other gigantes plaki recipes. This is bar far my favorite. And, it’s meatfree/vegan. So, adding this as a meal or snack is also good for your health and the planet! 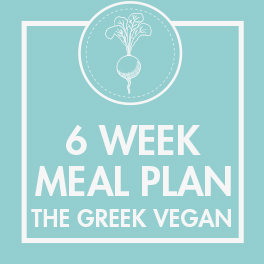 I am not yet a full vegan convert but MUST start eating healthier and ran across your site – I fell in love with Mediterranean food while visiting Greece many years back. I am Southern and was weaned on giant dry lima beans loaded with bacon and onions so am very familiar with cooking them – this sounded perfect – I used 1/2 cup of the beans thoroughly mashed and added to 1/2 cup of olive oil and the creaminess was fine for me – I also added 1 /2 cup fennel and 8 ozs garlic stuffed olives just my personal experiment – and OMG this was so good…and better the next day – I also tried baked veggies – I think I found them here – stellar! BOOKMARKED. Thanks for such great healthy delicious recipes. My daughter and I are both vegans and love gigantes. My question is, can I use dill in this recipe. I had tried them at a restaurant in Greece a couple of times and they were incredible. I have attempted many of your recipies in the past and loved them but I haven’t tried this one yet. Kiki: Thank you so much for sharing this wonderful recipe. I made it this past Sunday for Resurrection Day and it was loved by many. 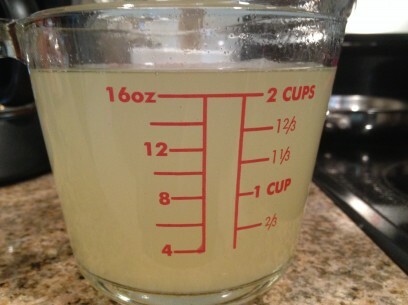 I doubled the recipe and since I love dill, I added the same measurement as you have for oregano. Plus I added 2 tablespoons of tomato paste because I like it saucy. Thanks again and God bless! Hi, I’m looking forward to making this. I’m cooking the beans on the stove right now, but I was wondering what the texture of the boiled beans should be, given that they’re going to cook in the oven for 2 hours with more liquid. Should be beans still be a little firm, like a canned garbanzo beans, or fully cooked and soft inside? Thanks. I think I left a comment previously asking what texture or doneness the beans should be at before being baked in the oven. For me, having them at a sort of al-dente texture, obviously not done yet, before assembling and baking them worked well. Came out very soft and creamy after being in the oven for a couple of hours. I’d also add a bay leaf or two and other seasonings in the water in which the beans are cooked. This is delicious and wonderfully creamy and flavorful. I did cut the oil waaay down to 2 tablespoons and I didn’t bake them at all! I started with dry beans and I’m not a soaker, so I pressure cooked them for an hour in vegetable broth and let the pot depressurize on its own, then added the drained beans to the rest of the sautéed ingredients and simmered the whole pot, adding back some of the broth. Served with kalamata olive bread, it was superb! I made this last night and loved it. However, we baked for three hours and the liquid didn’t reduce nearly enough. Next time I will probably use just 1 cup of reserved water from beans and skip the other liquids. Or turn the oven temp up? Not sure. But flavors were delightful! Canned or fresh tomatoes ? Will a slow cooker work for this instead of the oven, or would it get too watery?